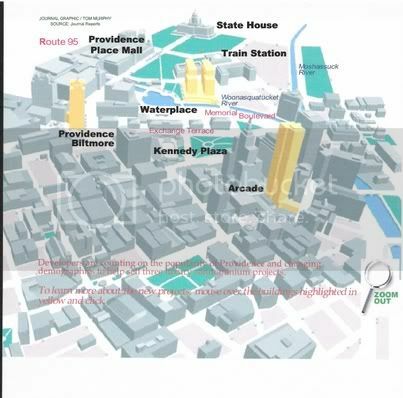 Has there been a rendering put together yet to classify all of the new high rises being built and to be built in downtown Providence? We have all seen the renderings for the individual buildings, but to see one and how it will affect the "entire" skyline would be great. to see one and how it will affect the "entire" skyline would be great. We need someone with some mad skills to do it (I don't think we'll see this coming out of the Planning Department), it exceeds my skills by quite a bit. Oh that's right, I forgot about that one. the scale of that is weird... the buildings on the right side look like they're all falling over. That rendering in a wide scale could fit the Hilton tower, [email protected], Atwells parcel, and this rumored tower in the financial district.